Hey everybody - well here it is - my first kit ever! I humbly offer it up as a freebie because I definitely have lots to learn :) I'm already nearly finished with my second project and it will be MUCH better. I considered not even sharing this kit because I don't think it's the best... but when I went back and looked again I thought well, maybe somebody can use it! The font I used for the title in my layout is called Burrito. You can download it on dafont.com for free! I would have loved to make an alpha to share with you for this kit, but their site doesn't allow that with their fonts. 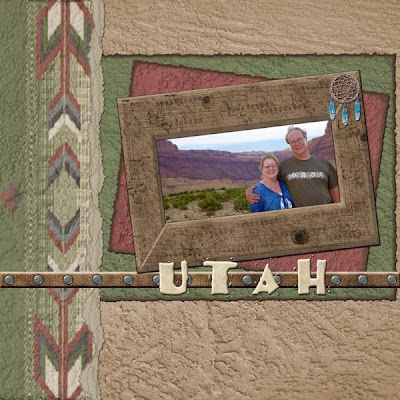 I used a velvet action by atomic cupcake to give the "utah" title it's leather-y look. Please let me know what you think of this kit if you download it. Like I said, I have lots to learn and I'm working on my second project! If you use this kit to create a layout, I would LOVE to see it! Send any pages to thedigitaldaisy@gmail.com and I would love to showcase them here on my page!! Looks great Christie! So many unique pieces! Your scrapbook kit looks lovely. I like the soft colors you chose. You should be very proud of yourself. I'm looking forward to watch you grow. Congratulations! Your kit looks wonderful! This is my favorite theme. I love the colors you used. This is so perfect - I've just come back from a trip and needed exactly these types of papers and embellishments!! Thank you! Thank you ladies for all the compliments!!! 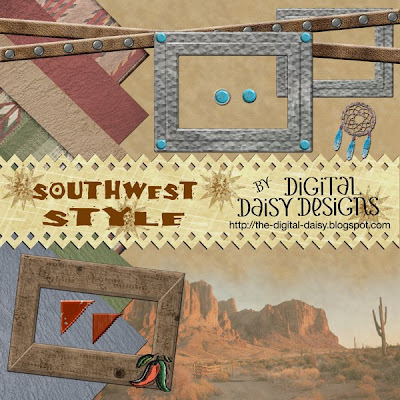 Love southwestern and cowboy themes! Thanks so much for sharing! Love your style and the colors you chose - simply beautiful! Thanks so much for sharing - incredible first kit!!! This will be perfect for our trip to Arizona this summer. Thanks. As a resident of the 4 Corners area...I can't wait to use your awesome kit! Hi, this is great. My family just returned from a Tauck Bridges Southwest tour so I've been looking for a digital layout for my pictures - thanks!! !